Let me be clear, I am no fan of the Affordable Care Act. I think it is wrong for New Jersey and for America. I fought against it and believe, in the long run, it will not achieve what it promises. However, it is now the law of the land. I will make all my judgments as governor based on what is best for New Jerseyans. That is why I twice vetoed saddling our taxpayers with the untold burden of establishing health exchanges. But in this instance, expanding Medicaid by 104,000 citizens in a program that already serves 1.4 million, is the smart thing to do for our fiscal and public health. If that ever changes because of adverse actions by the Obama Administration, I will end it as quickly as it started. Almost all of the same criticisms I leveled at Florida Governor Rick Scott this weekend apply to Christie and his reasoning. The Governor’s characteristic bluntness, though, merits one further point. By claiming that the Affordable Care Act (aka ObamaCare) “is wrong for New Jersey and for America,” and that “in the long run, it will not achieve what it promises,” Christie is admitting that he has decided to entangle New Jersey in a fundamentally flawed program that will fail to achieve its goals. But don’t worry. In the meantime, New Jerseyans can breathe easy because Christie, like Scott and the other Republican capitulators, will make sure to gobble up as much “free” federal taxpayer money as possible until he decides to pull the plug rather than help cover the costs. One of the first rules of persuasion is to be coherent. Christie’s tortured, self-serving logic doesn’t come close. Earlier this month, we at CFIF lamented the fact that the U.S. now claims the developed world’s highest corporate tax rate. Fortunately, as we noted, a bipartisan consensus is emerging in favor of reducing and reforming that rate. A high corporate tax rate impairs our ability to attract domestic and foreign investment. Because capital and information flows more freely across borders in the Internet age, disparities in the corporate income tax rate can now have a greater impact on location decisions than in the past. The number of Fortune Global 500 headquarters in the United States decreased from 179 to 133 from 2000 to 2011, while China (25.0 percent tax rate), Switzerland (21.2 percent tax rate), and Korea (24.3 percent tax rate) experienced sizable increases over the same period. De Mooij and Ederveen (2005) found that a one percentage point reduction in a host country’s tax rate increased foreign direct investment by 2.9 percent. The OECD (2011) found that corporate income taxes, of all the different types of taxes, are most harmful to economic growth and capital accumulation. The intellectual consensus thus continues to coalesce. Now it’s time for the White House and Congress to act before more harm is done. In case you haven’t seen it yet, check out the ObamaCare Burden Tracker (pdf), a summary of 157 rules and regulations that will impose an annual paperwork burden of 127,602,371 hours on the American economy. The ObamaCare Burden Tracker is a joint project of the House Committees on Ways and Means, Education and Workforce, and Energy and Commerce. Though depressing to read, the report is due to a lot of tedious work by hardworking committee staff members. Because of it, Americans can see just how much economic productivity is being sacrificed in compliance costs. As I write this, the Senate is voting on the nomination of Chuck Hagel for Secretary of Defense. It is doing so without a single word of debate (other than a quick summation of his resume by Senate Armed Services Committee Chairman Carl Levin of Michigan). So, after voting two weeks ago to reject cloture on the nomination — a move by definition meaning that the opponents want more time for public debate — those same opponents now are not taking the opportunity to, you know, actually debate. No summary arguments will now be recorded for history about why so many found the nomination so troubling. No attempt will be made to lay before the public a full, well-organized, incisive explanation of what the stakes are. All that remains is the impression that senators two weeks ago threw a mere hissy fit, utterly pointless except to show that they could stomp their feet and whine if they darn well wanted to. Opposing senators two weeks ago asked for more time to examine Hagel’s record. Plenty of new material has emerged since then, much of it serving to reinforce the earlier objections to the nomination. And plenty of other new material, even material intended for eventual release to the public, remains publicly unavailable for now specifically because Mr. Hagel refuses access to it. This, of course, raises questions about what else Mr. Hagel is hiding. So, having demanded time for new material to emerge, and having seen new material emerge, why are the opponents now declining the opportunity to discuss those materials, and to review the old ones, for the public record, and to try to convince some of their colleagues to withdraw their support? By Senate rules, 30 hours of debate is allowed post-cloture. Cloture was invoked yesterday. Instead of 30 hours, though, the Senate used all of about three minutes, featuring only the aforementioned summary by Sen. Levin. This is a disgrace. It would be a disgrace if the shoe were on the other foot and it was a Republican nominee who might have to wait a whole extra day or two before taking office. It is a disgrace because it is an abdication of the Senate’s responsibility to hold open debate for the sake of the public, whenever weighty issues are to be voted on. Citizens should be sickened that we have been put through two more weeks of bother, all in the name of further debate, and then denied any serious debate at all. No wonder the public so often remains in the dark about the real workings of, and reasoning behind the workings of, their elected Congress. No wonder the public holds Congress in such contempt. That’s what contemptuous behavior elicits — and today’s lack of debate was contemptuous indeed. 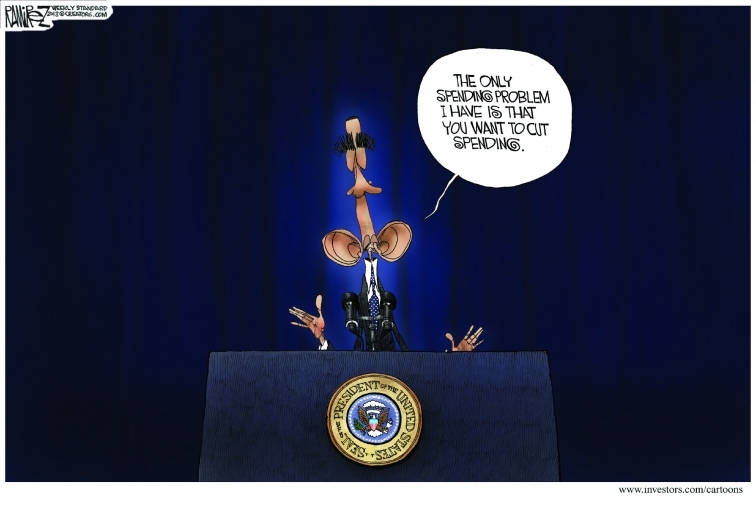 On Sequester, Is Obama Crying ‘Wolf’? In my weekly spot last Thursday on the terrific WKRG-TV, channel 5 news in Mobile, I explain why, just possibly, this battle over the “sequester” might end better for Republicans politically than did the Gingrich “government shutdown” battles of 1995-1996. It could be that Barack Obama has overplayed his hand, and overplayed his warnings. I reported last night at The American Spectator that the Alabama state Republican Steering Committee passed an emergency resolution requesting that U.S. Sen. Richard Shelby reverse course and return to opposing the nomination of Chuck Hagel as Secretary of Defense. I noted that this is a rare, and major, request, and that it represents overwhelming grassroots opposition to Hagel. Now, here, for the first time, I can post the resolution itself, rather than just quote from it. Rarely does a state party so openly take on its own senior U.S. senator — albeit in very respectful terms toward Shelby himself. This should send a message to other senators about just how outrageous this nomination is. Again, the resolution itself is here. 5:30 CST/6:30 pm EST: Larry Reed, President of Foundation for Economic Education: Freedom Academy Ft. Lauderdale, March 9, 2013. As usual, Ezra Klein’s Wonkblog has an interesting series of graphs that show the power of the federal government in granular detail. Today’s installment, courtesy of the White House, provides a state-by-state assessment of how the coming budget sequester will impact a range of federally-funded, state-run programs. These include popular spending on initiatives such as teachers and schools, work-study jobs, Head Start, job-search assistance, military readiness, law enforcement, child care, vaccines for children, public health, nutrition assistance for seniors, STOP Violence Against Women Program, and clean air and water. But while the White House is putting out these details to (ostensibly) convince the public that 10 percent across-the-board cuts in discretionary spending will be devastating to popular programs, there’s also a bit of subtle public shaming thrown in as well. Reading through the graphs it becomes painfully obvious just how much of modern American life is subsidized by federal tax dollars (and in some cases, also supported by state taxes). Getting confronted with that reality isn’t comfortable; especially when many people have come to rely on this kind of help. And yet, something has to change. We simply can’t raise enough taxes to cover the cost of every liberal social experiment, or even to pay for every good idea. Instead, we as a country need political and other leaders to think carefully about how to modify the social contract we’ve been under since the New Deal so that the generations to come will not be cheated out of their inheritance. Much like how they react to any reasonable reform ideas to Medicare (see any number of ‘Medi-scare’ tactics), liberals can’t lead on this modification project because they refuse to acknowledge that America has a spending problem in the first place. It thus falls to conservatives to improve on what we have, preserving what’s good and making it better. Part of the reason I’m optimistic about the future is that I don’t believe that details about our nation’s financial problems will shame a majority of citizens into zero-sum taxation. Rather, I think that once people become aware of how overextended is our current welfare state, they will reward politicians who can show how to scale back the public sector so that the private sector can flourish. So what should we make of all this? The take-away from the story of early childhood education is that the very best programs probably do a modest amount of good in the long run, while the early education program that can feasibly be deployed on a national scale, Head Start, has never proved long-term results in half a century of existence. In the most rigorous evaluation ever conducted, Head Start doesn’t show results that persist even until the third grade. Let me rephrase this more starkly: As of 2013, no one knows how to use government programs to provide large numbers of small children who are not flourishing with what they need. It’s not a matter of money. We just don’t know how. Asking [the right] questions forces us to confront a reality that politicians and other opinion leaders have ducked for decades: America has far too many children born to men and women who do not provide safe, warm and nurturing environments for their offspring — not because there’s no money to be found for food, clothing and shelter, but because they are not committed to fulfilling the obligations that child-bearing brings with it. Answering Murray’s questions would require a different sort of leadership than proposing yet another multi-billion dollar federal program. In a word, it would require statesmanship. Don’t expect the current president to be rising to that challenge any time soon. With all due respect to Newsmax CEO Christopher Ruddy, and as a fan of his website I mean that sincerely, I couldn’t disagree more with his defense of Florida Governor Rick Scott’s decision to accept ObamaCare’s Medicaid expansion. Like other Republican governors who’ve flipped on the issue, Scott announced last week that even though he remains philosophically opposed to ObamaCare, he would accept at least the law’s Medicaid expansion for the next three years because federal taxpayers – not the state – would pick up the entire price tag. Like many of the other capitulators, Scott claims that because the Supreme Court ruled ObamaCare constitutional, it doesn’t make financial sense for Florida residents to pay for ObamaCare through fees and penalties while other Medicaid-expanding states reap a windfall. Ruddy defends Scott’s about-face with two arguments I don’t find compelling. Scott has also made it clear that he has not agreed to continue the Medicaid expansion beyond three years, when federal funding will drop to 90 percent, and Florida could opt out at that point. Let’s get real. Once a state accepts more federal dollars and grows a politically sensitive program like Medicaid, the trend is to grow, not cut back. Moreover, Scott’s calculation betrays a canny reading of the political calendar. He’s up for reelection in November 2014, but will get credit for expanding Medicaid at no cost to state taxpayers in January of that year. If successful in his bid, Scott can continue to enjoy favorable press until January 2017 when the federal largesse starts receding and Floridians start feeling the cost of all that “free” healthcare. But by the time that happens Scott will be wrapping up his second term, and handing off that political football to a predecessor. So governors like Scott and [Arizona’s Jan] Brewer have to put aside their personal views and accept the reality of the situation. Since when do conviction conservatives want one of their own – as the Tea Party-backed Rick Scott claimed to be in 2010 – to “put aside their personal views” in favor of growing government? The “reality of the situation” with ObamaCare’s Medicaid expansion is that it’s completely voluntary. Any governor that accepts its terms is intentionally saddling his or her state’s future taxpayers with a costly new entitlement that will be impossible to scale back through the political process. After all, if politicians like Scott can’t weather the storm of saying no to entitlement increases when they don’t even exist, how does it pass the laugh test to think he’ll have the political courage to scale back when the feds re-impose reality? To be fair, Ruddy isn’t alone trying to defend the indefensible. Charles Krauthammer is singing a similar tune. But again, with all due respect, it’s just not true that you can claim to be a fiscal conservative and then capitulate on something as basic as a budget-busting expansion of Medicaid. Other cities are equally surprising, including #2 Birmingham, AL; #3 Indianapolis, IN; #4 Louisville, KY and#5 Charlotte, NC, all of which doubled their foreign born population between 2000 and 2011. Right behind them are #6 Richmond, VA, #7 Raleigh, NC, #8 Orlando, Fl, #9 Jacksonville, Fl and #10 Columbus, OH. All these states either voted for Mitt Romney last year or have state governments under Republican control. None easily fit the impression of liberally minded immigrant attracting bastions from only a decade ago. True, these immigrant-attractive locales don’t fit the stereotype for red state resistance to open borders and amnesty. But it doesn’t necessarily follow that a red state’s overall population is comfortable with the rapidly changing demographics of its urban centers. While Kotkin is bullish on the economic benefits of increased immigration to many of the South’s growing metro areas, it will be interesting to see whether these red states can absorb and assimilate their new arrivals in ways that enhance their civic cultures and state budgets, not diminish them. Nationwide, there are 5,277 charter schools serving 1.6 million K-12 students. But not all of them are urban minority, low-income students. Some serve suburban middle class families looking for an alternative to the curriculum on tap in a traditional public school. For example, Hillsdale College is spearheading a national campaign to create at least one charter school in every state with a classical education curriculum. Readers of the school’s popular Imprimus publication won’t be surprised to learn that that “These schools will be based on a classical liberal arts model and have a strong civics component that will equip students to understand and defend the principles of the Declaration of Independence and the Constitution,” according to the college’s website. So far, three parent groups have partnered with Hillsdale to create this distinctive new brand of charter school in Georgia, New Mexico, and Texas. The Texas version, Founders Classical Academy in Lewisville, began construction in 2012, and expects to start classes this fall. What more could a conservative education reformer ask for? There’s no question that the forthcoming federal spending cuts under the sequester aren’t ideal, particularly given the indiscriminate way in which they’ll be applied. Republicans in Congress, however, have rightly determined that indelicate cuts are a better option than a compromise that does little or nothing to arrest the trajectory of our debt crisis (even if they haven’t quite worked out the messaging yet). … Over many decades of defense budget battles, the Pentagon has often used a tactic known as a “gold watch.” It means to answer a budget cut proposal by selecting for elimination a program so important and valued — a gold watch — that Pentagon chiefs know political leaders will restore funding rather than go through with the cut. So now, with sequestration approaching, the Pentagon has announced that the possibility of budget cuts has forced the Navy to delay deployment of the carrier USS Harry S. Truman to the Persian Gulf. With tensions with Iran as high as they’ve ever been, that would leave the U.S. with just one carrier, instead of the preferred two, in that deeply troubled region. “Already, the threat of these cuts has forced the Navy to delay an aircraft carrier that was supposed to deploy to the Persian Gulf,” Obama said at a White House appearance on Tuesday, in case anyone missed the news. … Meanwhile, with a budget higher than it was even at the peak of the Iraq and Afghanistan wars, the Pentagon is resisting attempts to force it to audit its own finances. Congress passed a law back in 1990 requiring such an audit, to no avail. Last year, Sens. Tom Coburn, R-Okla., and Joe Manchin, D-W.Va., introduced the Audit the Pentagon Act, which would try again to force a look inside the maze of Pentagon spending. Yes, the Pentagon does represent some of the most vital spending that takes place in Washington. But conservatives especially should remember that it remains, on many levels, a conventional bureaucracy, prone to defend well-established power centers and jealous of every dollar that comes its way. The goals of cutting spending and preserving national security are not mutually exclusive. At NRO, libertarian columnist Deroy Murdock organizes a devastating litany of Chuck Hagel’s less-than-kind remarks and actions with regard to Jews and Israel. Well worth a read. Seriously strong stuff. See especially the two updates in this post, about Lindsey Graham again getting tough and about even more stonewalling on information by Hagel. This isn’t over yet, folks. Not at all. I’ll have more to say shortly about the broader topic of the nomination of Chuck Hagel to be Defense Secretary and about the use of the filibuster to stop him. But for now, this is really important: Daniel Halper of The Weekly Standard has been denied access to records of Hagel that are intended to be public, that will be public in the long run (within about 2 1/2 years) anyway, and that therefore obviously contain no information that Hagel himself intended to be kept private. For the good of the public, on such an important nomination, these records should be made available now, before any final vote on Hagel’s nomination. It’s not even a close call. Nobody can claim that these records are either irrelevant or of either a classified nature or of a too-personal nature — because Hagel himself donated them to a university for the purpose of public records. Even the New York Times should be compelled to support any request to delay the vote on Hagel until Senators can review the records. An investigative report from the Orange County Register deserves to be read in its entirety, but here’s my executive summary. Hundreds of schools in California enlisted the services of a bank to underwrite school construction bonds, known on Wall Street as “capital appreciation” bonds. The key attraction: no payments on principal or interest for 35 years. Of course, that kind of delay isn’t free. One school district in Orange County is estimated to owe $13 for every $1 borrowed when the bills come due. This means that for one $22 million bond issue in 2011, the Placentia-Yorba Linda school district will eventually owe $280 million – 13 times the original amount. It gets worse. In 2008, thanks to arguably illegal politicking by the bank underwriter, district voters approved up to $200 million in bond issuances. But while not all of the total are capital appreciation bonds, those that are could very well bankrupt the district for a generation or more. The failures on display here are all too familiar. Public officials opting to mortgage the future to look like a hero in the present saddle taxpayers with huge financial burdens. Financial whizzes with no ethical scruples abuse the system for big profits. And money wasted on concrete eye-candy – a football stadium and 600 seat performing arts center – while funding for classroom instruction gets reduced. While there is no silver lining to the Register piece, it’s worth reading as a reminder of how much American government at all levels needs a deep renewal of ethics, thrift, and a commitment to the common good. The health insurance tax is far greater than the minimum penalty for those who choose not to buy health insurance – further incentivizing young, healthy people to forgo purchasing insurance until they need medical care. The health insurance tax is just one of twenty-one new taxes imposed by ObamaCare on the health industry and its consumers. Thankfully, there is already bipartisan legislation filed in the House of Representatives to repeal this monstrosity, but unless there is a major breakthrough to convince liberals how bad ObamaCare will hamper health care, it looks unlikely to become law. Unless the Department of Health and Human Services (HHS) decides to once again bump back the deadline that passed yesterday, as of right now 24 states have told the Obama Administration they will not create a state-based health insurance exchange. Under the terms of ObamaCare, this means that HHS will now take over the process in these states, adding hundreds of millions in new costs to federal taxpayers. Moreover, the short time horizon between now and October when the plans must be available on the exchanges (they’ll be effective next January), means that there is likely to be an enormous push to hire more HHS bureaucrats to get the job done. It’s been said that when it comes to something being fast, accurate, and cheap, you can have any two but not all three. If history is any guide, the feds will go oh-for-three.